You finished your calculations and now you are about to present your results? 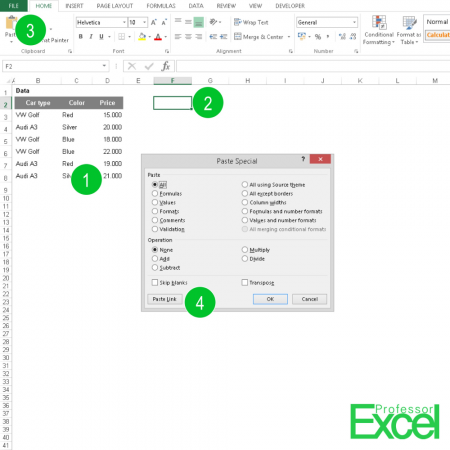 Well built Excel models usually separate the calculations from the results. Therefore “Paste Links” might be helpful for you, especially when your colleagues should not mess your data source. Instead of working with the original data, you could just link to it by copying it with “Ctrl + c”. Select the cell which you want to paste the copied cells as a link. Instead of pasting it now with “Ctrl + v”, paste it using “Ctrl + Alt + v” (Paste Special). In case of large Excel models, it’s recommended doing this with a new Excel worksheet, so that your results are really separated from the calculations. As your data is linked to your original source, you can edit the original source as usual and the linked table refreshes automatically. Instead of sending your original data to others, you now only send the new sheet.